Girafarig in game: 9,937 Who? Important notice! Pokemon Girafarig is a fictional character of humans. Girafarig made its anime debut in The Psychic Sidekicks! under the ownership of a girl named Cherry. A Girafarig belonging to Sonny appeared in Cruisin' for a Losin', in which it went up against Drew's Masquerain during the Battle Stage of the Rubello Contest. Morrison introduced Ash and his friends to his Girafarig in Saved by the Beldum. A Girafarig under the ownership of Roman appeared in A Full Course Tag Battle!, in which it was used alongside Kylie's Drifloon in a Tag Battle against May's Blaziken and Dawn's Piplup in the Seven Stars Restaurant. Lyra called upon her Girafarig to help break down a locked door during the episode Gone With the Windworks!. Lisa used a Girafarig to battle Ash during the opening credits of Spell of the Unown: Entei. It was able to defeat Ash's Chikorita. A Girafarig was among the Pokémon resting in some hot springs in Entei at Your Own Risk. A Girafarig under the ownership of a Trainer battled in a qualifying match for the Silver Conference in A Claim to Flame!. Lucian used his Girafarig against a Scizor in An Elite Meet and Greet!. Girafarig made a small appearance in The Rise of Darkrai as one of the Pokémon Darkrai hit with a Dark Void. 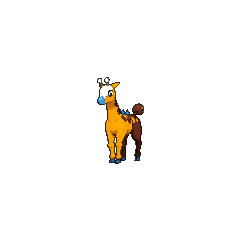 A Girafarig appeared as a mask for the festival in Capacia Island UFO!. EP156 Girafarig Ash's Pokédex Girafarig, the Long Neck Pokémon. Girafarig has a second head on its tail that bite those who approach it carelessly. Girafarig first appeared in Into the Unown as one of the Pokémon used by Harry, of Team Rocket's Elite Trio. It was used in attempt to capture Suicune in Miltank Melee, it fell asleep temporarily by Parasee's Spore in Iduibitably Ditto. It was used in Great Girafarig, to battle Eusine where it used its tail to find him but it fell into its trap and got electrocuted. 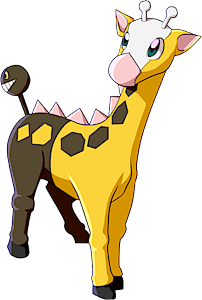 In Quilava Quandry, a Girafarig is one of the Pokémon used by the Day-Care Couple to train Gold. Morty later helped a trainer to locate her lost Girafarig in Misdreavus Misgivings, it has a scar under its eye. Later the same trainer was one of the people who volunteered their Pokémon for transfer sending her Girafarig in The Last Battle XIII. 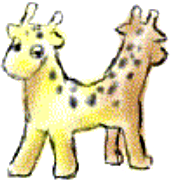 A Girafarig was later seen under Lucian's ownership. It was used to move books with its mind and bring them to its Trainer. Does more damage against Flying, Bug, or Fairy types. Girafarig's name is a palindrome. Girafarig is based on a Giraffokeryx, which resembles the okapi and the giraffe. Girafarig's small second brain may have been based on the Stegosaurus, an herbivorous dinosaur which is believed by some paleontologists to have possessed a second brain in its tail, improving its reflexes against predators. 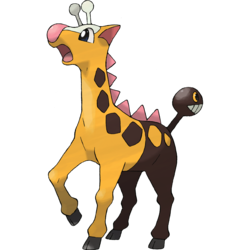 Girafarig is a palindrome based on giraffe, based on its two-headed and reverse appearance. Kirinriki is palindrome of 麒麟 kirin (giraffe), and also a combination of kirin and 念力 nenriki (telekinesis). Kirin is also the name of the Qílín, the Chinese unicorn. The Qilin was feared by criminals as it was able to detect guilt. After sensing the guilt, the Qilin would stare at the guilty party and pierce its heart.